Love it!!!!! Run forever! I already had a smaller Dyson stick, great for hardwood and tiles. Not so good on carpet. Would only run for about 20 minutes max! When I used this one the first time I was delighted. Did my whole house and was still had half charge. My house is 4300sq ft. For the difference in the money this is my choice!!! The New Dyson V10 Motorhead Cordless Vacuum Cleaner is the most Versatile Handheld out there, with Advanced Whole Machine Filtration, Dyson's Digital V10 Motor, and Three Different Power Modes there's no place dirt can hide! The Dyson V10 Absolute cordless vacuum comes equipped with the Direct-Drive Cleaner Head which drives bristles deep into the carpet to remove dirt. No cord to unravel, plug in, or drag around, restricting your reach. You can quickly and easily clean when you need to. The Trigger releases instantly so battery power is only used for cleaning. The Dyson V10 Motorhead delivers up to 60 minutes of fade free suction when using a non-motorized tool and 20 minutes with the Direct Drive Cleaner Head. The Dyson V10 Motorhead features a new hygienic dirt ejector to drive out trapped dust and debris in single action. There's no need to touch the dirt. The center of gravity is located towards the grip for easy, lightweight cleaning up top, down below and in between. The wand quickly detaches for handheld cleaning and the tools fit directly to the machine. 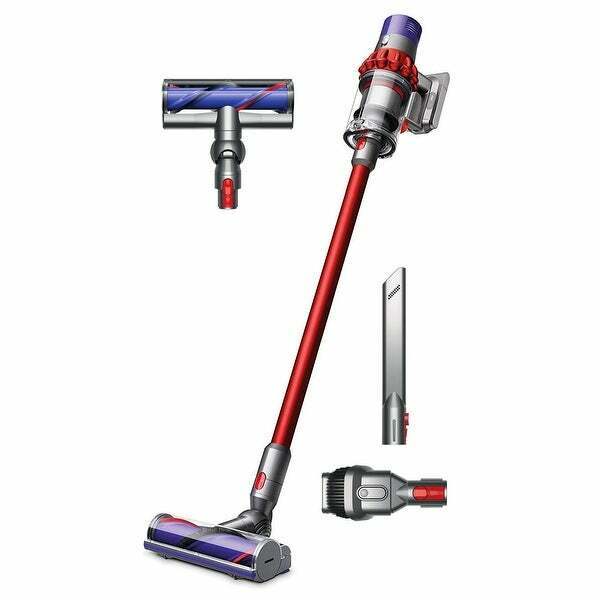 Dyson V10 Motorhead uses patented 14 cyclones, a post motor filter, and a sealed system to ensure that the air that leaves the machines is cleaner than the air you breathe. Also includes Extra Dyson-engineered tools for homes with pets, like the Crevice Tool and a Combination Accessory Tool. Dimensions 12.0 In. X 6.0 In. X 35.0 In. We had the V6 and going to the V10 is a must. Best quality of Dyson product. Cleans well with strong suction. Easy to use and simple to clean. Come in fast and well packed delivery. Thanks Overstock. Wonderful vacuum. Easy to carry, lightweight and super durable. Gets the job done in no time at all!